You’d think a day off would make me full of energy for the workout today. It was more like working out after a long nap. I felt sluggish mentally. Somehow I managed to fight through feelings of wanting to take a break in the middle of the workout. Still need to straighten out these arms a little better. Also I failed the last push jerk attempt and had to drop the bar and repeat it. So tired. I made a few additions to the original recipe just to experiment. 1. I could’t find mahi mahi and ended up using halibut. 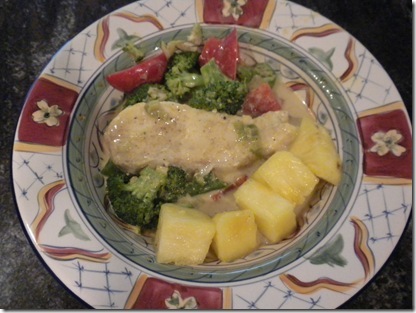 Tip from Amy: Frozen is good enough for this recipe and a lot cheaper than fresh. 2. I added a little broccoli. The ends soak up the juices really well. Cut the florets small and steam them a few minutes first. They take longer to cook than the peppers. 3. I added a little ginger and a little cinnamon to the curry. Specifically I used Vietnamese Saigon Cinnamon from Savory Spice in Boulder. It is outrageously expensive but there is no substitute. 4. I served it with grilled pineapple chunks. Pineapple is so good with coconut curry. If you decide to toss it right in the sauce like I did definitely grill it first or you will get too much pineapple juice in there. 5. Tip 2 from Amy: I used part chicken broth. Coconut milk is fairly high in fat. Amy, thanks for the great recipe! And thanks to my volleyball-playing friend Ashley for turning me on to the pineapple coconut curry at Spring Thai. Yum! you snatched 210#?!! I am so behind. Yeah, last week I couldn’t get 95 and suddenly this week I did 210. Paleo is amazing. Hahaha! Um, no. That should have said squat. Fixed.